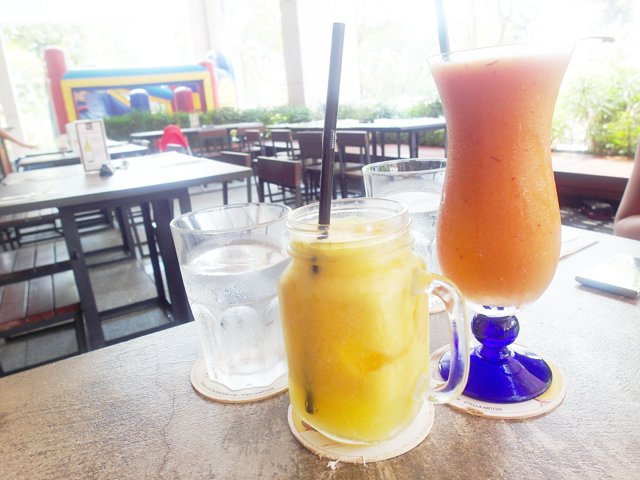 Some time back, I was invited to District 10 Bar & Restaurant to try out the brunch food. I was extremely looking forward to it because I love brunch food! We were hosted at the UE Square outlet, which was newly revamped with a new look. The bar, dining hall and a private dining room is accompanied by a windy alfresco area, great for breathing in the weekend air while tucking into brunch. 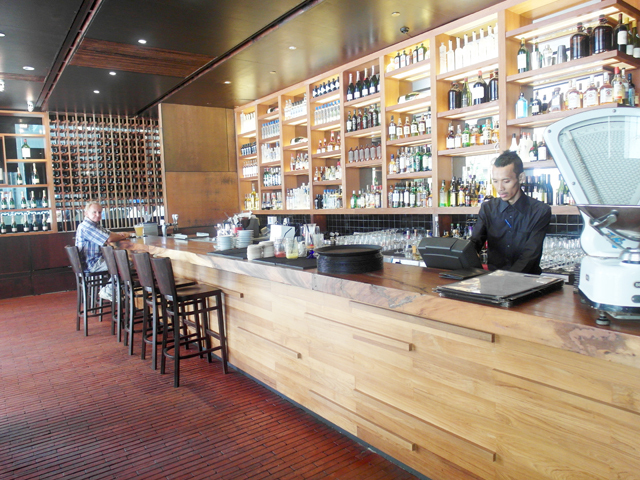 New highlights ranging from yummy bar bites to gourmet dishes refreshed the menu, and now has a more extensive wine list with boutique labels. Lets try out the food! Most of the time, Eggs Benedict is my top brunch choice. 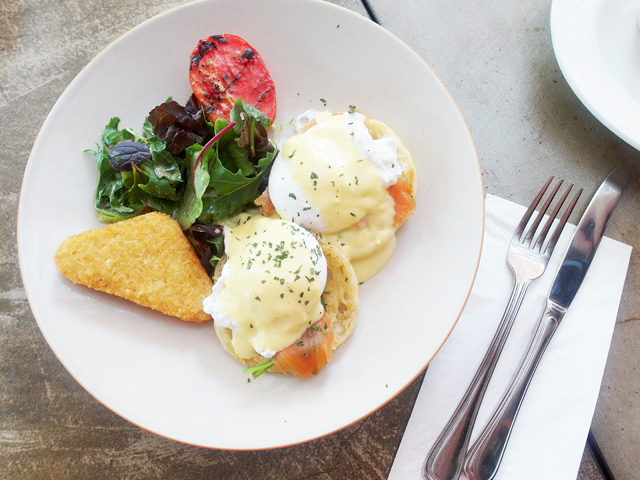 The Eggs Benedict with Sauteed Spinach, Smoked Salmon & Hollandaise Sauce ($16++) here didn't disappoint. Although the muffin was a little too soft to my liking, the spinach and smoked salmon went well with the eggs. Thumbs up! 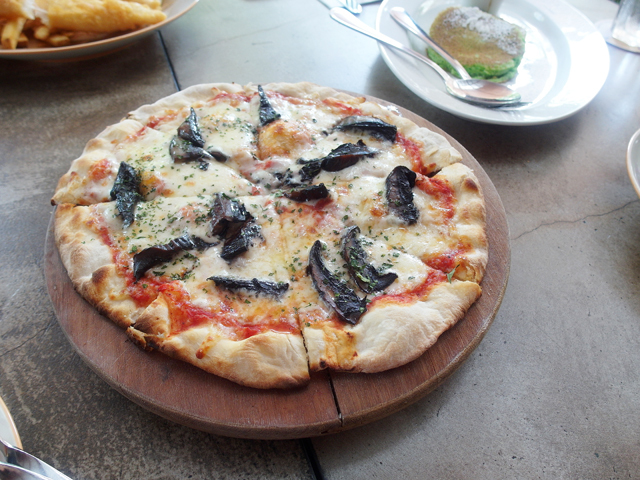 The Pizza with Portobello Mushrooms, Tomato Sauce & Truffle Oil ($26++) was my favourite from the meal!! A MUST TRY!!!! The fragrance from the truffle oil was extremely strong and the pizza was especially delicious, I couldn't resist the last piece even though I was extremely full at the end of the meal. 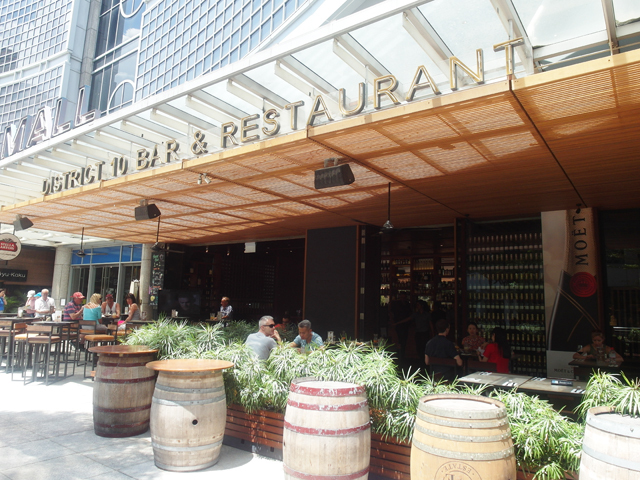 During Happy Hours (11am – 8pm daily), besides 1 for 1 on Draft Beer, Housepour Spirits & Exotic Gin Tonics, the Gourmet Pizzas at also at $10 nett! 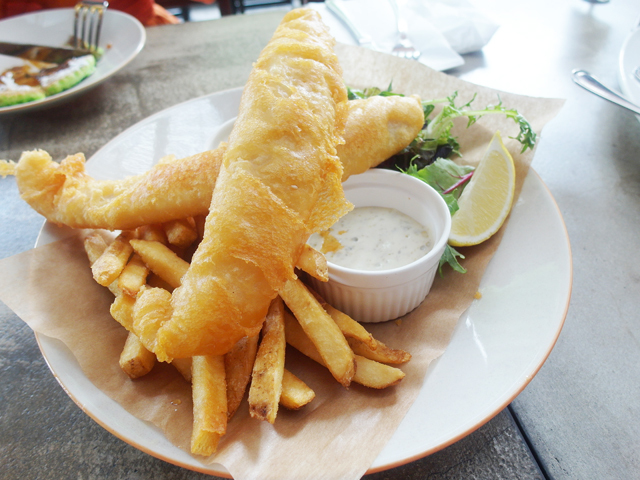 Hoegaarden Battered Fish & Chips with Mint Mushy Peas & Tartare Sauce ($22++). This is highly recommended on their menu and i saw quite a number of people ordering it that day. The portion is huge and the fish is fresh. Love it! 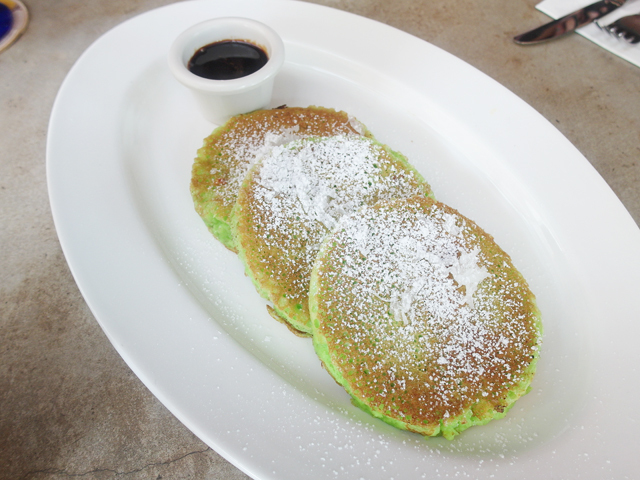 Inspired by local flavors, the Pandan-Coconut Pancake with Gula Melaka Syrup ($9++) was an interesting creation. I give this thumbs up as well! Had a cup of freshly squeezed orange juice ($9++) to go with everything. Nowadays very few places serve real orange juices and I'm glad this does. See the bouncy castle behind? It is there during the weekends for parents to enjoy their hearty brunch while the kids can play all they want! Awesome! And if you are looking to pamper yourself a little more, here's the Brunch Promotion: Add a dash of indulgence and luxury with District 10's Moet and Chandon Champagne promotion, one of the most affordable around at $68++ a bottle! 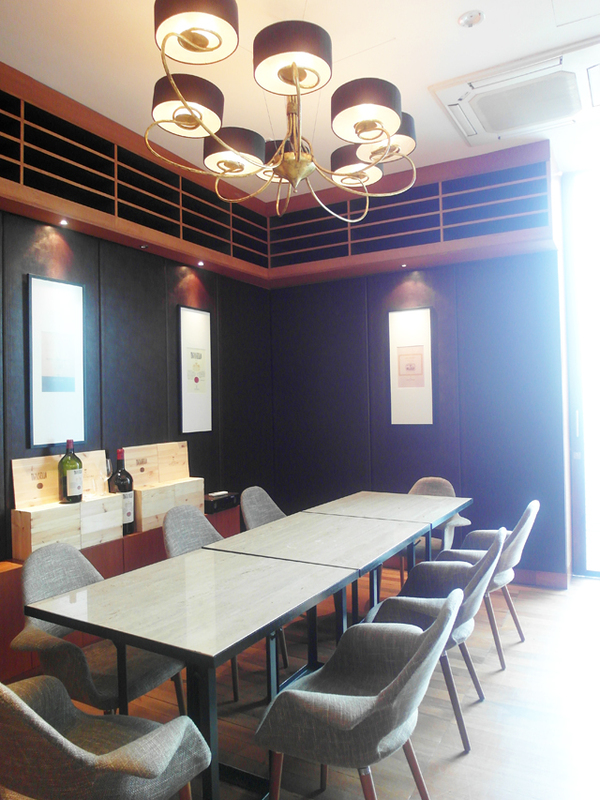 For parties/gathering up to 12 people, you may book the prettily done up Antinori Private Dining Room, which also has a little alfresco area. The room also offers a customised menu curated by Chef Luca according to budget and specific requests! You can make smile on your kids face easily. If you have rented our bounce house, the kids have surely had a great time jumping and falling and laughing all day long.